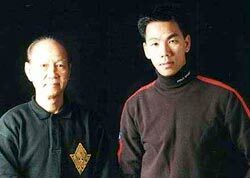 Sifu Gorden ...... after many years of learning, teaching, and developing Kung Fu, Sifu Lo Man Kam has also passed his art down to his son Sifu Gorden Lu in hopes that a new generation of Grandmaster Yip Man’s family will continue to lead in the promotion of Wing Chun. After completing study of the system under his father, Gorden continues to broaden his knowledge of Wing Chun under the tutelage of Sifu Lo’s close friend and junior brother, Sifu Duncan Leung. 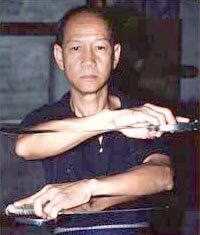 Because of Sifu Lo's international reputation, kung fu schools from around the world seek out Sifu Lo to speak at seminars and demonstrations; both Sifu Lo and his son Gorden personally teach, making these events lively and exciting, and further helping participants to absorb the art. 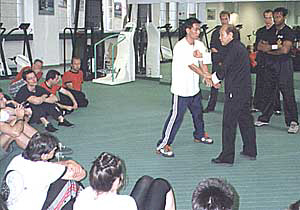 As such, they are the only Father-Son team to conduct seminars in American and European martial arts circles.